Photo: The Bedford Bypass westbound approaching it end. VA 297 #1: Created in Oct 1935 (CTB) running from VA 291 Heald's Corner 0.80 miles towards US 501 on the western outskirts of Lynchburg. In Sept 1942 (CTB), VA 297 was downgraded to SR 1204 which apparently never has connected to US 501. Today this is the E-W part of Linkhorne Dr. VA 297's eastern end was on what is now the grounds of Linkhorne Middle School. VA 297 #2: Appeared in September 1942 (CTB Minutes) as an upgrade to SR 624. Originally ran from VA 128 (curr US 460 Bus-Graves Mill Rd. jct) west to the Campbell-Bedford County Line, just short of VA 127 (curr SR 811). 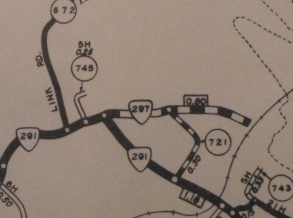 In May 1945 (CTB Minutes), VA 297 was extended west to the ECL of Bedford, replacing SR 624. In May 1946 (CTB Minutes), VA 297 was extended west to VA 43. VA 297 extended to Bedford. 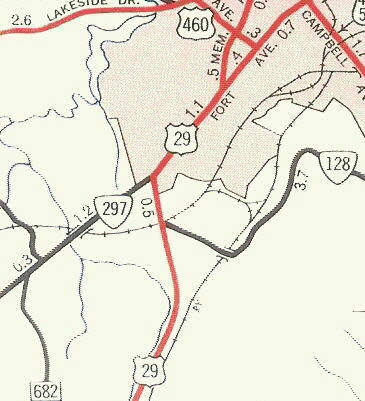 In November 1948 (CTB Minutes), VA 297 east was extended along Fort Ave. to US 29, replacing part of VA 128. In October 1964 (CTB Minutes), VA 297 east was rerouted at VA 126 Graves Mill Rd, turning east along new construction (completed about Sept 1965 - CTB Minutes) to meet US 29 (curr US 29-US 29 Bus jct). The piece along Fort Ave became an extended VA 126. VA 297 east end 1944-48. VA 297 east end 1948-1965. VA 297 east end 1965-70. 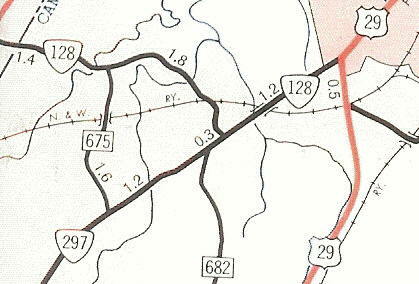 In December 1969 (CTB Minutes), the Bedford Bypass was built, and is shown on the 1970 map as VA 297 Bypass. WSTS (Roanoke) did a story on the opening and it was in fact posted as VA 297. 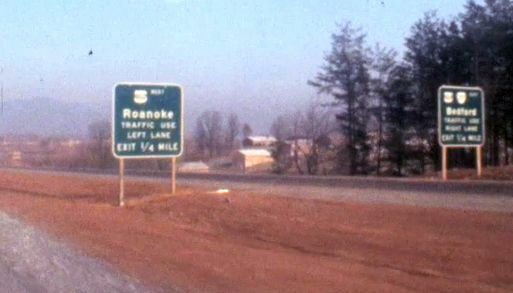 In December 1970 (CTB Minutes), VA 297 was renumbered as part of US 460.